Here's a variation on one of my all-time favorite cakes, Sunken Grape Cake. The basic recipe is the same, with the substitution of orange for lemon zest and rhubarb for grapes. It's a delicious cake for breakfast or brunch, but I've also served it after dinner as birthday cake to rave reviews. Preheat the oven to 350 degrees. Butter and flour a 9-inch springform pan. On a large baking sheet covered with a silicone baking mat, spread out the rhubarb slices. Drizzle with the honey. Cook for 10 minutes, until the rhubarb is just tender, then remove from the oven and set aside. Cream together the butter and sugar until light and fluffy. Add the eggs, one at a time, and mix thoroughly between additions. Add the zest and almond extract. In a separate bowl, mix the flour, ground almonds, and baking powder, then stir the dry mixture into the egg mixture just until blended. 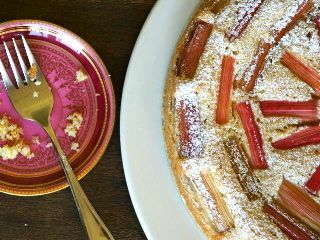 Smooth the batter into the springform pan and distribute the cooked rhubarb evenly over the batter, pressing the pieces in lightly. Bake for 50 to 60 minutes, until a toothpick or skewer inserted in the middle comes out clean or with tiny crumbs clinging to it. Let cool, then invert onto a plate and dust lightly with powdered sugar.